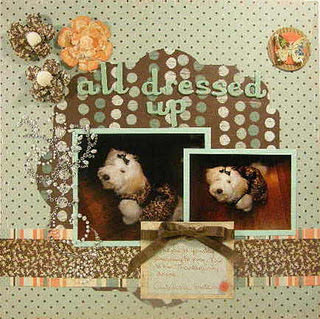 "Lasting Memories" Scrapbook Layout Challenges: FEATURE for the Day - "All Dressed Up... and CUTE as a button." FEATURE for the Day - "All Dressed Up... and CUTE as a button." Good morning! I would like to share with you a layout from one of our fellow past DT members SUE. Isn't her doggie just adorable?? Gosh this little cutie has a better wardrobe than I do!! :-) Love everything about the layout and especially her added BUTTON at the end of her sentiment in her journaling! Fantastic idea! Thanks for joining us. Now it's your turn Sue to grab the "I was Featured" badge and display proudly!! Have a great day everyone! I am off to work. I hope to see some new layouts when I get back?? Maybe I am wishful thinking?? It's possible. Happy Scrappin' day to you all!